Parking for the Lovely Stadium turf field is located off of Red Spring Rd. Please park here and enter through the gate on that parking lot. Also, please advise that there are no sports drinks or gum allowed on the turf field. Water only, thank you! Field is located on the left of the school. Parking is allowed in the lot next to the school (both sides) and the field is through the small path. Directions: Take route 2 either east or west to exit 59, which is Rte. 60/Pleasant Street - Arlington. Follow Rte 60 for about 2 miles to Mass Ave. Take a left onto Mass Ave and follow for about 1/2 mile to a set of lights. At the lights take a right onto Mill Street. Take first available left which leads you to the Arlington High School fields. From 495: Take Exit 21A (Main Street, Hopkinton), go approximately 5 miles and the Middle School will be on your left. From Rt. 128 or the Mass. Pike: Take Rt. 128 to the Mass. Pike west. Take exit 12 and after the toll, bear right and get onto Rt. 9 east. At the first light, take a right onto Country Club Lane. At first stop sign, take a left. Go straight at 1st stop sign and at second stop sign, make a right onto Badger Road. (This is a wierd right as you will turn hard to the right and then go straight onto Badger Road). Follow Badger Road into Ashland where it will become Myrtle Street. You will then come around a corner and will be on Main Street in the center of Ashland. Go to the 4th light and make a right onto Rt. 135 west (East Union Street). Go through the next 2 lights and the Middle School will be on your right after Dunkin Donuts. The field is to the right of the school in the outfield of the softball field. Hunt field is located at Ashland Middle School, 87 West Union St, Ashland, MA 01721. It is a grass field to the right of the school, next to the turf field. Some parking is available next to the field, more parking is available to the left of the school entrance. Take Rte 95 to Exit 5 toward RT-152, Attleboro/Plainville. At the end of the ramp, turn left onto Robert F Toner Blvd. Turn right at the lights onto North Main Street toward Attleboro. Turn left onto Holden Street. Take Rte 2 East to Exit 59. Turn right onto Route 60 (Pleasant St.) West to Belmont Center. At the second set of lights, turn left on Leonard St.--this will take you through Belmont center. Head straight under the stone railroad bridge and turn left just after the bridge. This is Concord Ave, the high school and Harris Field is five or six blocks past the pond on the left. Park on street in front of the field or turn left just after passing the pond on Underwood St. Park in the lot. From the South take 93 to exit 15. At the end of the ramp you must turn right, follow to the rotary. Go into the rotary and take the second turn out of the rotary onto Day Blvd. You will see the State Police Barracks on your right. Follow Day Blvd. for about a¼ mile and you will see parking on your right along Carson beach. If the 1st lot is full use the 2nd lot after the McCormick Bathhouse on your right. The Sanders field is across from the State Police Barracks in Moakley Park (a.k.a. Columbia Park). From the North Take Rte. 93S to exit 15 at the end of the ramp you will turn left on to Columbia Rd. follow that to the rotary. Go into the rotary and take the second turn out of the rotary onto Day Blvd. You will see the State Police Barracks on your right. Follow Day Blvd. for about a ¼ mile and you will see parking on your right along Carson beach. If the 1st lot is full use the 2nd lot after the McCormick Bathhouse on your right. The Saunders field is across from the State Police Barracks in Moakley Park (a.k.a. Columbia Park). Note: The field is a new synthetic turf field use only molded cleats or sneakers. Turf behind Fresh Pond Mall. This is the back field. There is a parking lot off of Terminal Street. There is a parking lot off of Terminal Street. Take Route 3 North towards Nashua, NH to exit 32 (former Drum Hill Rotary). At top of ramp go straight through lights while moving to the left. Bear left at next set of lights. Take left and move to far right lane. Go straight through lights and proceed 1/10 of a mile and take a left into the parking lot for the turf field. Games are played on the Varsity Girls lacrosse field. The field is adjacent to the tennis courts off of Gifford Street. Georgetown High School Lower field is the Turf Field. You will see it on the right as you enter the school grounds. Park in either of the two parking lots in front of the school. If our coach indicates that your game will be played on the upper field, please follow the driveway in front of the school and around to the left. Park behind the school and follow the footpath up the hill to the field. From the East: Route 2 west to Route 111 exit (which is 4 miles west of Route 495); Route 111 north (through Ayer) to the school gates on the left (about 3 miles from downtown Ayer). Turn in through the 3rd gate and you'll see the fields immediately on your right. From the West: Route 2 east to Route 111; Route 111 north (through Ayer) to the school gates on left (about three miles from downtown Ayer). Turn in through the 3rd gate and you'll see the fields immediately on your right. From the North and Northeast: Route 495 south to R119 (Groton-Littleton Common, Exit 31); Route 119 west through the town of Groton to Route 111; Route 111 south (toward Ayer) for 1.5 miles to the school gates on the right. Turn in through the 1st gate and you'll see the fields immediately on your right. PLEASE DO NOT PARK ON THE GRASS. There are parking lots beside the fields as well as in front of and behind the athletic building. Coaches, PLEASE let your parents know that they are not allowed to park on the grass. We may lose our ability to play at Groton School if we can't keep cars off of the grass. There are no bathroom facilities. Please use the bathroom at one of the establishments in the center of Groton before arriving at the fields. Thanks. North & South Turf Fields are located behind the High School and Tennis Courts. As part of our permitting to use the new turf field facilities, the town has asked us to make all visitors aware of the following rules. • Park in the parking lots, not on the road around the HS. • NO CHAIRS on the turf fields. • NO FOOD or DRINKS - only water on the turf fields. • NO DOGS on the HS property. • NO GRILLING on the HS property. • Stay on the paths and do not walk on the grass/mulch area. 93 North to exit 48 (Rte. 213), to exit 3 (Howe St.) take a right off exit and proceed about 1 mile (you can see stadium form street) take a left onto Please View Street, stadium is 1/4 mile on left. 495 North to exit 47 (Rte. 213), to exit 3 (Howe St.), take a right off exit, and a right at next set of lights, proceed about 1 mile, (you can see stadium from street) take a left onto Please View Street, stadium in 1/4 mile on left. 1) Confirmation of the game schedule. Please note that Nantucket is very flexible. If you would like to adjust the start time of the games to accommodate your ferry schedule, then please feel free to ask if this is possible. 2) Number of players, coaches, and spectators who are planning to make the trip so that Nantucket parents may schedule the transfers accordingly. 3) Number of spectators that have handicap disabilities. Ferry Schedules: Primary transportation arrangements are with Steamship Authority. Steamship Ferry Group Information: Christine Habermann, MBGLL’s Executive Director (director@mbgll.org), has already notified the Steamship Authority of the fact that your team is traveling to Nantucket. Please contact the Steamship Authority to confirm the details for your team’s travel arrangements and to obtain your group authorization voucher. YOU NEED A GROUP AUTHORIZATION VOUCHER IN ORDER TO TRAVEL AT THE DISCOUNTED RATE! Conduct on the Ferry Please remember that you and your team are ambassadors for Mass Bay Girls Lacrosse League. Ensure that the players are supervised by an adult at all times. Also, please leave the ferry in the same or better condition than when you arrived. Thank you for your cooperation. Transfers to the field Once you arrive on Nantucket, A representative of Nantucket Lax will meet you and lead to our courtesy bus to transfer to the field. The busses hold 35 people, if your group is larger please allow the players and coaches to travel first anf the bus will com back. The field is at the Nantucket Park & Recreation Delta Fields on Nobadeer Farm Road. Take Milestone Road from the Rotary, Nobadeer Farm Road is on the right heading toward the airport. Delta Fields are on the left (at Nantucket Trading Post). Parking lot is on left right after the storage facility. Lunch:Nantucket will provide lunch for the team. Handicap Accessible If you are traveling with someone who has special mobility requirements, please contact the Head Coach to coordinate on-island logistics.Also, please note that the Steamship Authority’s ferries are handicap accessible. Questionable weather? For questionable weather inquiries, call the head coach. Also, please remember to call the Steamship Authority, (508) 771-4000, the morning of your departure to ensure that the ferry is running. The weather may seem fine on the mainland, but it could be rough and windy near Nantucket. How should the team dress? Please remember that temperatures on Nantucket are frequently cooler than on the mainland. Also, the weather can change quickly on the island. So, please make sure that parents and players bring multiple layers of clothing to be comfortable as the day and weather progresses. Field Facilities: There is a bathroom facility at the field that is usually open. However, to be safe, you should try to use the facilities at the Steamship Authority before transferring to the field. How should my team get reimbursed for expenses? The head coach of each team may submit an expense reimbursement form and receipts to the Executive Director (MBGLL, P.O. Box 294, Groton MA 01450) for the cost of pre-arranged, group-rate ferry tickets. MBGLL will only reimburse expenses for team players and the coaches. How should an umpire submit for reimbursement? MBGLL will reimburse umpires for round-trip travel to the island at our negotiated rate. In order to receive this rate, you must coordinate with the traveling team and travel round-trip with them. MBGLL will also reimburse for your parking expense (approximately $10). Please submit the reimbursement form (found above) and receipts to MBGLL, P.O. Box 294, Groton MA 01450. Natick fields are at the Natick High School, 15 West Street. They are accessed from Rt 27 N and S. Rt 27 can be reached from the west via the Mass Pike, Rt 9 or Rt 135. From Rt 27 South. Proceed south and cross Rt 135 in Natick Center. Continue on Rt 27 S bearing right at a fork just south of Natick Center. Proceed approximately 1 mile to West Street and turn right on West Street. Pass Natick Recycling on left and GRASS field is next on your left, parallel to West Street. Parking is ahead 20 yards on right. TURF field is inside football stadium. Parking and entrance to the turf field is past the stadium on the left. From Rt 27 N. Enter Natick from Sherborn. Pass Sassamon Trace gold course on left. Turn at next left –West Street. Pass Natick Recycling on left and GRASS field is next on your left, parallel to West Street. Parking is ahead 20 yards on right. TURF field is inside football stadium. Parking and entrance to the turf field is past the stadium on the left. From Rt 27 South. Cross Rt 135 in Natick center. Follow Rt 27 S making sure to bear right at fork just south of the center. Proceed on Rt 27 about 1 mile to West Street on the right. Turn right on West Street. Grass field is on left, parallel to the road just past Natick Recyling. Parking is up on right about 30 yds. Turf field is in the football stadium. Proceed past stadium on your left and parking and entrance to the field is from the right end of the stadium. From Rt 27 North. Follow 27 north through Sherborn into Natick. Proceed past Sassamon Trace Golf Course on left. West Street is the next left. Turn on to West Street. Grass field is on left, parallel to the road just past Natick Recyling. Parking is up on right about 30 yds. Turf field is in the football stadium. Proceed past stadium on your left and parking and entrance to the field is from the right end of the stadium. From the South: Take Rte. 95 North. Get off at Exit #56 (Scotland Road). Of of the ramp, follow Scotland Road all the way to its end. You will have gone through the Newburyport Industrial Park. At the end of Scotland Road, take a left at the lights onto Low St. You will see fuller Field on your right. Parking for Fuller Field is at the Nock Middle School, which is 200 yards past Fuller Field on the same sid of the street (the right). From the North: Take Rte. 95 South to Exit #57 (Rte. 113/Newburyport). Get onto Rte. 113 East (Storey Ave.) and immediately get into the right lane. Take a right onto Low Street (CVS is on the right and Dunkin Donuts is on the left). Follow for about 2 miles. Go past the Nock Middle School. Fuller Field is 200 yards past the Nock Middle School on your left. NOTE: Parking for Fuller Field is at the Nock Middle School. Park in the lot and walk up to the fields. There is no parking up at the fields unless a handicap placard is displayed. Go to the end of Chase Ave and then turn left into the parking lots. The Varnum Brook field is behind the line of trees. The girls lacrosse field is not in front of the Nissitissit middle school. 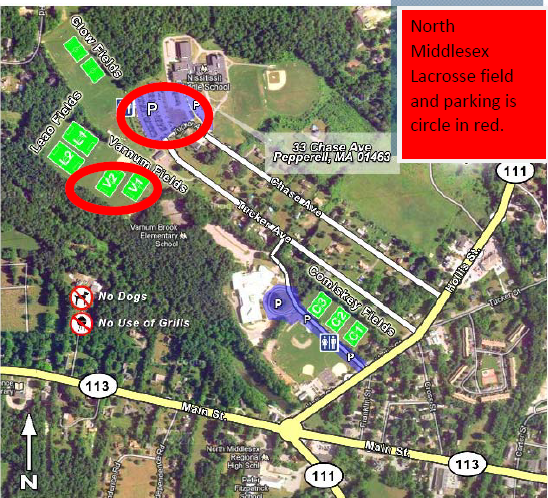 Directions: Fields are located at the Westford Stony Brook Middle School. The two Girls fields are located at the rear of the school grounds next to the tennis courts. Directions: This field is located at the public high school (Westford Academy). Trustees Field is the multi purpose turf field inside the track. > to Landrigan Field up the hill on Hemlock Road on the Right. Merge Rt onto Watertown St. which changes to Winter St.
At end, take Lt onto Concord Ave.
Take Slight Rt onto Mill St.
At end, take Lt onto Trapelo Rd. Proceed straight through first set of traffic lights, street changes to Waverley Ave. Please no gum, non rubber cleats, food, and water only on turf field. Thank you!! Directions: These fields have a carry in and carry out trash policy. Please reminder your players and parents to carry home their trash.